A knowledge of the chemical structure and concentration of organometal compounds throughout the ecosystem is important in working out the pathways and mechanisms by which metals distribute themselves throughout the environment. 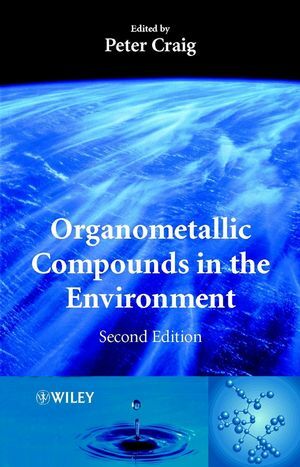 Treating the topic as an integrated subject area, the Second Edition of Organometallic Compounds in the Environment covers all the recent developments in analytical techniques and reports all the new work that has been achieved since the first book. Covers the general importance and characteristics of organometallic species. Includes general developments in analytical techniques. Discusses several minority elements including antimony and selenium. The book addresses the subject in a single, manageable size and each chapter can be used either as a single review or sequentially within the topic area. A useful resource for all researchers and scientists in industry working with organometallic compounds, including, chemists, environmentalists and ecologists. Professor Peter Craig is an Emeritus Professor in the School of Molecular Sciences at De Montfort University, Leicester, UK. His research has been particularly concerned with metal methylation, reactions and transport in the environment and with the roles of mercury, tin, lead, arsenic and antimony in the natural environment. Occurrence and Pathways of Organometallic Compounds in the Environment—General Considerations (P. J. Craig, et al.). Organomercury Compounds in the Environment (R. Mason & J. Benoit). Organotin Compounds in the Environment (F. Cima, et al.). Organolead Compounds in the Environment (J. Yoshinaga). Organoarsenic Compounds in the Marine Environment (J. Edmonds, et al.). Organoarsenic Compounds in the Terrestrial Environment (D. Kuehnelt & W. Goessler). Organoantimony Compounds in the Environment (P. Andrewes & W. Cullen). Organosilicon Compounds in the Environment (A. Hirner, et al.). Other Organometallic Compounds in the Environment (J. Feldmann). Organoselenium Compounds in the Environment (P. Craig & W. Maher). Some Standard Reference Sources on Organometallic and Environmental Organometallic Chemistry.